I assumed the church bookstore was empty as I meandered from shelf to shelf. Eventually, though, I became aware that someone else also studied the literary items on display. Without speaking, we independently perused the wares. Oblivious—and as you will soon see, uninformed—I said, “Oh, hello. What did you say is your name?" He repeated his dignified name for me. “So, what do you do here?” I ventured. (I think he cleared his throat before answering), “I am the senior pastor.” If only a mulligan existed in conversation! Larry and I were invited to participate as guest speakers for this mega church missions conference in a geographical area unfamiliar to us. But that was no excuse. This error landed in my court. My lack of readiness left me humiliated, and left the church’s leader feeling awkward. Questions of identity are not limited to awkward conversations in church bookstores. Nor is identity confined to modern-day society. 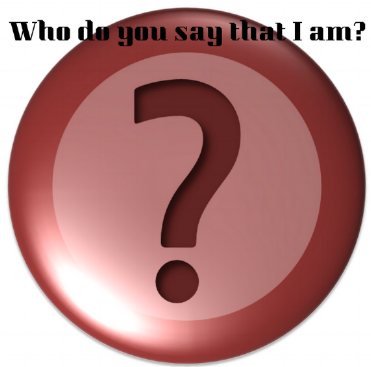 In fact, identify stood at the heart of the question Jesus presented to His disciples in Matthew 16:16. Who do you say I am? You are my ticket to heaven. You are an emergency exit when the building of my life is on fire. You are an historical figure. You are an excellent doctor when I face a medical crisis. You are a counselor when my marriage is in turmoil. Yet, it is Peter’s answer of epic proportions which reverberates down through history: You are the Christ, the Son of the living God. Human destiny hangs in the balance with an individual’s response to this watershed question. Faith and belief allow for only one right answer: You are the Christ, the Son of the living God. Here we pivot from Peter's ancient answer to the present, and bring THEN into NOW. Actually, you and I minimize Jesus when we compartmentalize Him only to eternity. If (and He is) the Christ, the Son of the living God for THEN, He is the Christ, the Son of the living God for NOW. In this season of unexpected success? Who do you say that I am? In this painful betrayal: Who do you say that I am? In this uncomfortable set of circumstances: Who do you say that I am? In this heartache: Who do you say that I am? In this uphill challenge: Who do you say that I am? In this financial setback: Who do you say that I am? In the restructuring at the office: Who do you say that I am? In discovering my teenager's receipt left in the car: Who do you say that I am? In this time crunch to make a lifetime decision: Who do you say that I am? Just as He asked Peter yesterday, He asks you and me today. The bottom line is the only right Answer: You are the Christ, the Son of the living God. The opportunity to honor Him as the Christ the Son of the living God, integrates faith and belief into real life, real problems, and real dilemmas. When you and I yield to His Identity, we give Him full access and full authority into this moment, this second, and this situation. Who do you say that I am? You are the Christ, the Son of the living God. How have you personally answered this question of eternal destiny? How are you answering this question in a situation you face today?